It's March....can you believe it? I surely can't. 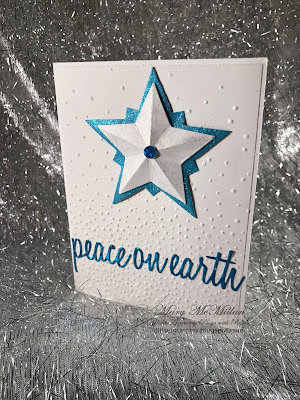 This month's Sparkles Christmas Challenge is from Joan. The theme is: Twinkle Twinkle Little Star. I received this die from "Santa" and how perfect is it.... It's Tim Holtz as is the sentiment, which is also a Christmas gift. I like the dimension on the star and what makes it easy....there are little hidden tabs that allow for easy gluing. I die cut the star from light weight stock scored and folded and glued it to a piece of sparkly blue which I cut using the largest star in the die set. I cut the sentiment from the same blue sparkly foil that I glued to card stock before cutting. The embossing folder is from Stampin Up. Pretty easy wouldn't you say? Gosh....this post is so short....I have so much going on this week that I feel like a brisk March wind is pushing me from one project to another....so, until next time. Happy crafting and remember to post your creations Here.... I will be checking to see what you've created. Mary, Your star is just stunning, and this card's colors are so pretty! So pretty Mary is your card l just love that sparkle too!